In the last Sunday before Christmas, the liturgy turns to Mary. We look forward to Christ’s coming. Through Advent we have prepared for his coming. Now we look for the perfect preparation, in the heart of Mary. The Preface for Masses of Advent says, “the Virgin Mother longed for him with love beyond all telling.” Her heart is the image of Advent longing and preparation. We turn this weekend to Our Lady of the Advent. Mary is the earth; our hearts are the earth, where the divine Word is planted. We must be opened up, and so let him be born in us. 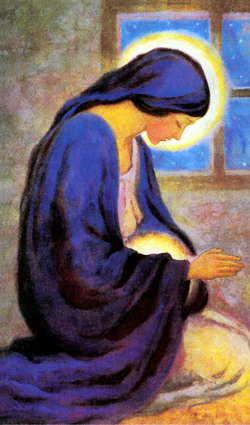 Yet the mystery of Mary is the mystery of grace. She does not make Christ appear. She receives him from like dew from above. And so the Old Testament reading, from Micah, emphasizes the two poles. “You, Bethlehem-Ephrathah, too small to be among the clans of Judah, from you shall come forth for me one who is to be ruler in Israel.” It is not by Mary’s might that Christ is born from her. She is little. In fact, he is born in her only because she is little enough to receive him. We wait. We look forward. We prepare. But our preparation is not to be the great doers, but to be waiting, looking forward – to let him be our peace. Come, Lord Jesus! Elizabeth, “filled with the Holy Spirit,” prophesies, “Blessed are you among women, and blessed is the fruit of your womb.” Mary is the earth that brings forth the Savior. She is blessed, because Emmanuel is with her. That is the true blessedness of Mary, the blessedness to which we aspire: to be the earth that receives the dew from above, to hear the word and keep it – to believe that what was spoken to us by the Lord would be fulfilled. That is the way of Advent: to look forward with trust in the promise, to prepare by waiting for him to be our peace – in his coming at Christmas, his coming at the end of time, his daily comings. Come, Lord Jesus! But there is a second, external kind of preparation tied to that primary, internal one. Mary went with haste to help Elizabeth, with her words and, we assume, with her hands. Christ came, not merely to be our ritual, not merely to be our Sunday or holiday observance, but to claim our entire lives. 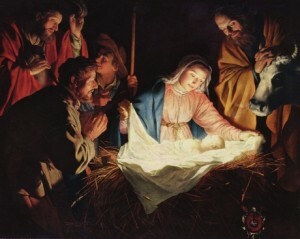 He came not for the moment of Christmas, but for the entirety of a human life. We welcome him, too, by consecrating our lives to him. We join Mary in making our every moment revolve around his coming. In what ways do you pray, “Come, Lord Jesus”? The Third Sunday of Advent is Gaudete Sunday. Midway through the dark seasons of Advent and Lent, the priest takes out his joyful “rose”-colored vestments and we get a little taste of Christmas joy. Why? “The Lord, your God, is in your midst, a mighty savior.” The city that had been abandoned now receives God in its midst – a fitting theme for Advent. Rejoice! And the city rejoices because the Lord himself rejoices: “He will rejoice over you with gladness, and renew you in his love, he will sing joyfully because of you.” It is the Lord’s own joy that overflows from his hearts into ours. In Summa theologiae, Thomas Aquinas concludes his discussion of the one God with a whole question on God’s happiness: the happy God. And he begins his moral theology with five whole questions on our true happiness, which we find in God alone. Here in the midst of Advent, we remember that our happiness is when the happy God is among us, his joy overflowing into our hearts. The reading from Philippians connects this overflowing happiness to other aspects of the Christian life. First, to kindness: “I say it again: rejoice! Your kindness should be known to all.” Kindness seems a weak thing. But here we see it as a sign of our spiritual life. Kindness overflows from our joy. Or to put it the opposite way: why are we unkind? Because we lack joy. And why do we lack joy? Because we are too far from the happy God. Here is an examination of conscience. Or we can take other angles. The Greek is epieikeis. St. Thomas has a question in the Summa on this Greek word (IIa-IIae q. 120). He says it’s a kind of flexibility about rules. Rules matter – but sometimes they don’t apply. Why are we inflexible? At heart, because we lack joy. Our Gospel has two parts: one talks about vocation, one about Christ. First, “the crowds asked John the Baptist, ‘What should we do?’” What should we do now that we have repented? “Whoever has two cloaks should share with the person who has none.” Let the day’s spirit of joy again be our key. Pope Francis talks about a Church that is “poor and for the poor” and about “the joy of the Gospel.” The two go together. When we do not know the joy of Christ, we hoard material possessions, and push others away. When we know joy, we can afford to be generous. To the tax collectors he says, “Stop collecting more than what is prescribed,” to the soldiers, “Do not practice extortion, do not falsely accuse anyone, and be satisfied with your wages.” He calls us not to leave our ordinary lives behind, but to live them with gentleness and justice – as ones who have found their joy and their peace in the presence of the happy God. In the second part of our Gospel, John says, “I am baptizing you with water . . . . He will baptize you with the Holy Spirit and fire.” Jesus gives us more than nice words. He pours his very Spirit into us. And summing up what we have read: “His winnowing fan is in his hand to clear his threshing floor and to gather the wheat.” When you thresh wheat, first you beat it, to separate what is rich and worthy from what is merely chaff. Then you wave a fan over it, and the chaff, which is nothingness, is blown away. Let his joy, his joy, be the fan, which blows away all that does not matter, and leaves us kind, flexible, moderate, and just, full of love, because we have found the pearl of great price. Where do you manifest a lack of joy? In the liturgical year we have just begun, we are reading Luke’s Gospel. Luke’s is the most complicated of the four. At the beginning of the year, we have to consider where the Gospel begins. As we prepare for Christmas, we see St. Luke’s himself focused on preparing. Luke 1 begins with a very formal introduction, then tells the story of Jesus’s birth – but preceded in each act by the birth of John the Baptist. Luke 3 ends with a genealogy – a story of ages of preparations, and a clue that the introduction is ending – and then Luke 4 launches into Jesus’s public ministry; but this, too, he precedes with a preliminary: “And Jesus, full of the Holy Spirit, returned from the Jordan, and was led in the Spirit in the wilderness.” Luke is full of preliminaries and preparations. And when John finally begins to preach, it is about preparation – in several senses. John preaches a baptism of repentance, a preparation for the coming of Christ. He preaches, “Prepare the way of the Lord.” And that preaching has itself been prepared for him, since “it is written in the book of the words of the prophet Isaiah.” So many preparations. John calls them to prepare the way by repenting of their sins. The words of Isaiah are about making “straight his paths,” preparing a road for Jesus to walk on. Repentance is that road. Repent, prepare the way – call out for your Savior. The first reading, from the prophet Baruch, takes us deeper into this vision of the Savior. But in Baruch’s vision, it is not God who walks on the path, but us – and not we who make the path, but God. The Savior prepares a path for us. And as in Isaiah’s original ending, Baruch talks about the glory of God: “Jerusalem . . . put on the splendor of glory from God forever; wrapped in the cloak of justice from God, bear on your head the mitre that displays the glory of the eternal name.” The Savior wraps us in his glory. This is what we prepare for in Advent. This is why we repent and prepare a way: so that Jesus can give us all the glory of God. Our reading from Philippians again turns us to preparing for the final coming of Jesus: twice our reading speaks of “the day of Christ Jesus.” As the world prepared for his first coming, and for his ministry, as John prepared the way by calling us to prepare the way, so our life in this world is meant to be a preparation to meet Jesus. That preparation is above all God’s work. The Savior “who began a good work in you will continue to complete it until the day of Christ Jesus.” He prepared the world for himself; he sent his word to John – and he sends his grace to prepare us for his coming. We prepare to receive him by receiving him. And yet the good work he begins in us is our work. Paul prays (because it is a grace), “that your love may increase ever more and more.” Paul longs “for all of you with the affection of Christ Jesus,” and we are called to prepare for Jesus by the same longing and affection and love for one another. We are called to be “pure and blameless for the day of Christ.” But we become that way by growing in love and “in knowledge and every kind of perception, to discern what is of value.” We are given the eyes of love. Finally we will live “for the glory and praise of God” when Christ has entered into us, to prepare us for himself. As you prepare your house for Christmas, how are you letting Jesus prepare you for his coming? Our end is our beginning. The dying of the liturgical year in November culminates with our first Sunday of Advent – and we continue to look to the end of time, preparing for Christ to come in glory as we prepare for Christ’s coming as a baby to renew all things. We recall the classic sermons about the three comings of Christ. Christ came in weakness long ago. He will come in power at the end of time. And he comes to us every day in between. They looked forward to the coming Messiah, the king who would set everything right. They looked forward to Jesus, all sweetness. But which coming were they looking forward to? In his first coming, he was swaddled in sweetness – and poverty and nakedness and cold, destined to be rejected and suffer death on a Cross. In his final coming he will bring terror and destruction, “people will die of fright” – and finally peace will reign. And in our everyday, he calls to us, stands at the door knocking. He begs to enter in, and we leave him like a homeless man, out in the cold. Our Epistle is from 1 Thessalonians – one of Paul’s most apocalyptic letters (along with 2 Thessalonians). The message is simple. We want “to be blameless in holiness before our God and Father at the coming of our Lord Jesus with all his holy ones.” The apocalyptic message is simply that we should be prepared to meet him when he comes, however he comes. “Depart from me, you cursed, into the eternal fire which is prepared for the devil and his angels. . . .
To prepare for his final coming, we are to live every moment as if he is knocking at the door. But who can stand when he appeareth? In our Epistle, not only does Paul exhort us that, “as you received from us how you should conduct yourselves to please God . . . what instructions we gave you through the Lord Jesus” – not only does he teach us with Christ’s words. Better than that, he begins, “May the Lord make you increase and abound in love for one another . . . so as to strengthen your heart.” He sends us Christ’s Spirit, the power of his grace, to strengthen our hearts. Only Christ can prepare us to stand before him. Our Gospel concludes, “Beware that your hearts do not become drowsy from carousing and drunkenness and the anxieties of daily life.” St. Paul – and, here, St. Luke, a disciple of St. Paul – has this habit of building up terrible sins, and then sliding in normal things. I’m not a carouser; I’m not drunk –and yet, swallowed up by the anxieties of daily life, it is all the same. In Advent, as we prepare to celebrate the first coming, we are reminded to prepare for the final coming by watching for Christ in all his little daily comings. We ask him to come with his grace so that we may welcome him in his little ones and be prepared to stand before him in glory. When did the anxieties of your daily life keep you from welcoming Christ today? The Last Sunday of Advent – as the last week of daily Mass readings – frames Christmas with the Gospel readings that lead up to the birth of Christ, the “annunciations”: to Joseph (in Matthew), to Zechariah (for Elizabeth), and to Mary. This readings are important because they “tell” us what is happening. The words of the Gospel, and of the Scripture and proclamations that surround the Gospel, explain to us what is going on. Those words make possible what Paul here calls “the obedience of faith,” whereby we accept that proclamation. In fact, this Sunday’s explanations of who Jesus is take us into the importance of words. In fact, this Gospel is important – some of it, at least, worth memorizing – because it tells us who Jesus is. “He will be great and will be called Son of the Most High, and the Lord God will give him the throne of David his father, and he will rule over the house of Jacob forever.” The Church gives us these words – just as Luke gave them, and Gabriel gave them to Mary – because without the words, we don’t know what is happening. We say “a picture is worth a thousand words.” But a picture cannot tell us that this baby is God. A picture cannot tell us that he is “Son of the Most High,” that he will sit upon a throne, that he will rule. Just like a picture cannot replace Gabriel’s greeting, “Hail, full of grace! The Lord is with you.” No, we cannot know that the Lord is with her, or that she is full of grace, without words. It’s unfortunate that the words of our translation water it down to “she was greatly troubled at what was said.” Rather, the original says she was troubled at his word. She “pondered what sort of greeting this might be” – but “pondered” translates “dialogos”: she “dialogues,” “words back and forth,” rolls those words around. She ponders the word. Think of that. An angel appears! An awesome image! But what shakes Mary is the words. Because the words show that an appearance much less impressive than the angel – the appearance of an impoverished child – is something vastly greater. So Mary “says” to the Angel (in Greek, she “words”), “how can this be,” and he words back, “The Holy Spirit will come upon you.” No words, no clarity of what is going on. Ponder these words! Holy Spirit. King. Son of the Most High. The Lord is with us. Fullness of grace. The first reading takes us back to David, to unpack these words about him “the throne of David his father.” Ignore the words of 2 Samuel, and we can’t understand the words of the Angel in the Gospel. David wants to build at temple. But the Lord speaks to him. The Lord says that his impulse is good – how nice to know, through the Lord’s words, how to judge our feelings? And the Lord tells him to wait: like Mary, David to is a handmaiden, accepting the commands of his Master. Promises are words. They articulate things that could not be without words: what will happen in the future, and the firmness of the kingdom, and the fatherly relationship.” Without hearing the word, we have none of this. But finally, the words articulate God’s power. Romans calls God, “him who can strengthen you . . . the only wise.” How we need those words! And the Psalmist “sings” “the promises,” the “faithfulness,” the “covenant,” and the relationship of the “Father.” How we need these words! Are you listening to God’s word? Do you let him explain to you what’s really going on – both in the manger and in your life? Each year, the third Sunday of Advent points us again to John the Baptist. In the year of Mark’s Gospel, which we have just begun, we also get a lot of John’s Gospel. This Sunday we get John’s version of “the voice of one crying out in the desert”: John’s take on last week’s theme. It is worth pondering from many perspectives. The theme is the similarity and difference between John the Baptist and Jesus. We get a snippet from John’s fabulous prologue, then skip ahead to the beginning of the action, right after the prologue. Now, this tells us something about John the Baptist – but also about John the Evangelist, and about all of us. First, it emphasizes the difference. One purpose of John the Baptist is to show what Jesus is not. John is the great prophet. He calls to repentance. He proclaims the sovereignty of God. John is a great moral teacher. And one of his chief purposes is to show that Jesus is more than that. Our reading from Isaiah takes us into this likeness and dislikeness. “The spirit of the Lord GOD is upon me, because the LORD has anointed me; he has sent me to bring glad tidings to the poor” – says Isaiah. Yes: the spirit was on Isaiah; the Lord anointed him; God sent Isaiah to bring glad tidings – just as he sent John, too. But this is also – and preeminently – a description of Jesus. Indeed, in Luke’s Gospel, Jesus begins his public preaching by applying this reading from Isaiah to himself: “And there was brought to him the book of the prophet Isaiah. And when he had opened the book, he found the place where it was written, The Spirit of the Lord is upon me” (Luke 4:17-18). And the people are amazed: “they wondered at the gracious words which proceeded out of his mouth. And they said, Is this not Joseph’s son?” (v. 22). They were surprised that Jesus took the mantle of Isaiah. We can be equally surprised that the mantle of Jesus was on Isaiah. God has sent us, too, “to bring glad tidings to the poor, to heal the brokenhearted, to proclaim liberty to the captives and release to the prisoners, to announce a year of favor from the LORD.” But like John the Baptist, he has called us not to preach ourselves, but Jesus: a year of favor from the Lord. Like John the Baptist, we prepare for Jesus’s coming by being his heralds, by showing that he is the healer – he is the healer. “He has clothed me with a robe of salvation” – He! “So will the Lord GOD make justice and praise spring up before all the nations” – the Lord! But if I love him, if I long for him, if I want to prepare the way for him, I am called to love that “justice and praise,” to bring his healing to others. And so in our reading from First Thessalonians, Paul says, “Do not quench the Spirit. Do not despise prophetic utterances.” The Spirit rests on us, too, sends us as prophets of Jesus. “May the God of peace make you perfectly holy . . . . The one who calls you is faithful, and he will also accomplish it.” Holiness is his work. But he will do it. He clothes us in his mantle, to prepare us for his coming, and so help prepare the way in this world. Do we carry the mantle of Jesus? Are we clear that it is his mantle, not ours? Do we point others to Christ? During the Advent season, our family follows a special devotion to St. Joseph, who prepared the way for coming of Christ. We do much of Advent by candlelight – at least dinner and Evening Prayer – to think about the the True Light coming into the darkness. To Evening Prayer we add the Litany of St. Joseph. But maybe more important than the Litany, we put out our nativity set piece by piece. The first week it is just St. Joseph, wandering in the candle light, looking for a place for Christ. The second week he finds the empty manger. The third week – Gaudete Sunday – Mary appears at his side. And the fourth week, all the animals arrive, eagerly awaiting our joyful hope. For me at least, the Litany serves primarily to help me ponder the image of St. Joseph, preparing the way. But I find St. Joseph, wandering alone in the candlelight, also a fine image of the threefold coming. He is preparing for the birth of Christ. But he also seems to stand for the Church of the last age, awaiting the final coming of Christ. And so he helps us enter into the apocalyptic meaning of the everyday: that here and now, we wait for Christ to come. Every day the Liturgy begins with Psalm 95: “if today you hear his voice, harden not your hearts,” else he will say, “they shall not enter into my rest.” Every day we are looking, listening, for the coming of Christ. Every day we are longing to enter into his rest. The Greek word “apocalypse,” almost exactly translated by the Latin word “revelation,” does not mean “cataclysm” or “end of the world.” It means “removing” (apo-, re-) “the veil” (kalupsis, velatio). Apocalyptic literature, including especially the apocalypse, or “revelation” to St. John at the end of the Bible, is not primarily about the end of the world. It is about now. It draws away the veils that cover spiritual reality, so that we can see what’s really going on: the great spiritual warfare, between the Lamb and the Beast. It shows that the real end time is now: not because the world is going to end tomorrow (though it might), but because the ultimate battle is already at work. Or, to put it more positively, to show that we stand, today, with St. Joseph, preparing for the coming of Christ. The true battle is not really which side we will choose. The Anti-Christ is only a negation, the rejection of Christ. The true battle is whether we will accept Christ. Whether we will welcome him, make a place for him to come. The final judgment will be nothing but gazing on the face of the poor Christ, the one who was pierced, the Lamb who was slain, and accepting him or not. And we prepare for that final judgment by the daily judgment: by welcoming or not welcoming his coming today. We welcome that coming in the Eucharist. But we welcome it, also, in the “least of these”: in Matthew 25, Jesus says that when he comes in glory, the “judgment,” our true acceptance of him in his final coming, will be based on a lifetime of accepting or rejecting him in the hungry, thirst, naked, sick, foreign, and imprisoned. We prepare to welcome him in the final coming by welcoming him in the daily coming. And in Advent we are encouraged to think of those two comings in terms of his first coming: as a poor child, welcomed into the world by the poor man St. Joseph. So who was St. Joseph? The Litany calls him “obedient and loyal.” The second word gives some depth to the first. He does what he is told by God’s messenger – but not just in blind obedience, but more deeply, in loyalty, faithfulness, love. He is “lover of poverty.” He who wanders in the candlelight could run away from the call of Jesus. With Jesus, there will be no room for him in the inn. He will be an exile. But the measure of his loyalty, the measure of his love, is his embrace of that poverty: for where Jesus is, there is a treasure this world cannot offer. And he is “husband of the Mother of God,” protector of Mary and of all virgins, of all that is delicate. He welcomes Christ not by being stern and cold, but by being tender, loving, loyal, by embracing the sweetness of Our Blessed Lady. Let us have the strength to stand against the apocalyptic spirit of anti-Christ – by joining the tender loyalty of St. Joseph, lover of poverty, model of workers, guardian of all that is delicate and innocent. What is the call of St. Joseph in your life this Advent? In all three years of the lectionary, the first Sunday of Advent puts us in an eschatological key with its call to “watch, for you know not the hour.” Only on the fourth and final Sunday do we turn to the Annunciation, and the immediate preparation for Christmas. John says, “prepare the way of the Lord.” But that way is repentance. This is key to understanding who Jesus is. John distinguishes between his baptism and Jesus’s: “I have baptized you with water; he will baptize you with the Holy Spirit.” But alongside that difference is a similarity; indeed, in order to understand what the baptism with the Holy Spirit means, we need to understand the symbolism of John’s baptism, without the Holy Spirit. The people “were going out to him and were being baptized by him in the Jordan River as they acknowledged their sins.” John’s baptism did not confer grace; it did not give the Holy Spirit; it did not wash away original sin. What it did was acknowledge sin. The people acknowledged they needed a new beginning. We cannot understand the grace of sacramental baptism until we understand the symbolism of repentance in John’s non-sacramental baptism. John was “proclaiming a baptism of repentance for the forgiveness of sins.” His message – and his baptism – was a call to repentance: metanoia, a change of heart. It’s not just that we say, “I’m sorry,” and God says, “oh, it doesn’t matter.” Rather, we say “God, I don’t want to be that way anymore” – repentance! metanoia! – and God gives us the grace to change. The true theological meaning of “mercy” is not that God overlooks our sins – he loves us far too much to just “overlook” anything about us. Mercy means he helps us: helps us to escape from sin. Grace does not “cover” our sins, it heals us. Because this is about repentance. That’s why John is important: John can’t cause God to overlook their sins. To the contrary, John tells them that their sin – and their repentance – matters. He calls them to repent. And this call to repentance, like the cry of conscience, is itself already a divine gift. “Behold, I am sending my messenger ahead of you; he will prepare your way.” It is God who sends us this prick of conscience, and we thank him for the new beginning. Our first reading is the passage from Isaiah that John is quoting. It is lovely – because conversion is lovely – but it is also brutal. So too, when he says, “Every valley shall be filled in, every mountain and hill shall be made low,” this is beautiful, because conversion is beautiful – but it is a call to repentance, a little scary, if we don’t also see its beauty. Every valley in your soul, and in the soul of your community: everything that is not right must be set right, before the approach of the King. Repent! Our reading from Second Peter explains this all by putting us back into an apocalyptic key. God is coming! When? Not yet: “he is patient with you . . . that all should come to repentance.” He delays because we are not yet holy. Again, the reading gets scary: when the Lord comes, “the elements will be dissolved by fire, and the earth and everything done on it will be found out.” Dies irae! We await the kingdom of God, and the King of righteousness. How do we prepare for the coming of Christ? By embracing that kingdom – by embracing his righteousness. Repent! What valleys and mountains impede the coming of Christ into your heart this Advent? Perhaps you are familiar with St. Bernard of Clairvaux’s famous sermon on “the three advents.” There was the first coming of Christ, in Bethlehem. There will be the final coming of Christ, on the last day. And there is his daily coming, today. Advent calls us to think of all three: to prepare to celebrate his first coming at Christmas by also thinking of his final coming, and by living each day in preparation for his coming. The Gospel reading, from Mark (we now begin Mark’s year in the Lectionary), gives three fine details. But both in the parable and in our lives, the gatekeeper’s job bleeds into all jobs. He watches for the coming of the Lord – but so too must everyone else, each in their own work. In the same way, we are not only called to be gatekeepers. In this life we are called to do much more than sit and wait. We are “each with his own work.” Rather, in our work, in all the particularities of the life Christ has given us, we are to be preparing for his coming. Not by setting aside our lives, but by living them fully. A second angle on the same thing: Christ is “the Lord of the house.” Our lives belong to him. Our houses (which we must therefore make fair as we are able), our children (whom we must raise for him), our jobs (which we must do as if working in his household), and everything else. The coming of the Lord doesn’t mean this life doesn’t matter. If he is “the Lord of the house,” the we must live our vocations more deeply, preparing for him. And a third angle: “you do not know when.” We could say there are two kinds of apocalpyticisms, a doctrinaire one and a moral one. “Doctrinaire apocalypticism” thinks the point is what we do know. We have secret knowledge. We know there will be a last day. (Notice that Christ himself is not that important to doctrinaire apocalypticism.) And sometimes people – more often Protestants, but sometimes Catholics too – get really excited about predicting when. But when he says, “you do know when,” he teaches a kind of “moral apocalypticism.” Oh, it’s true, we believe he will indeed come, to judge the living and the dead. But the point of this teaching is not that we know, the point is how we live. We are called to live like we don’t know when, so that we are prepared every day for the Lord of the household to come. Sunday’s first two readings teach, above all, that we need Jesus himself to prepare us for his coming. His coming at Bethlehem – and his giving of the sacraments – works in us to prepare for his coming today, and on the last day. The Psalm response speaks a key doctrine of grace: “Lord, make us turn to you.” That fabulous little line contains both sides of grace. On the one hand, grace is God’s work in us. He makes us turn. We can almost blame him for not turning us. We can’t do it on our own. But we do do it. “Make us turn.” God’s grace doesn’t work outside of us, it works in us. It causes us to turn. Jesus, cause me to love you; cause me to choose you; cause me to seek you and prepare for you. So Isaiah speaks those unspeakable words, found throughout the Bible: “Why do you let us wander . . . and harden our hearts?” We so desperately need God’s grace that we almost blame God for our failing. Without him we can do nothing (John 15:5). We live always in preparation for his coming – and in thanksgiving that he himself works in us to prepare us. What does the Lord of the household want you to be preparing? It is perhaps time for my annual self-help Christmas pep talk. For those of us with children – especially large broods of small children – one of the great ironies of the Church’s liturgical year is the singing of Silent Night at Christmas Eve Mass. The liturgy is beautiful. The world in silent stillness waits – to hear angels sing. A favorite (if somewhat silly) memory of mine is one Advent before Christmas. I went to an evening of recollection at a very big, beautiful church. Afterwards, somehow, I had the dark sanctuary for myself. I pulled out a hymnal and hummed “It came upon a midnight clear.” The silent stillness. The beauty. The waiting. The expectation. The angels! I seriously discerned religious life. I always imagine how beautiful the Christmas season could be celebrated in a monastery. The last week of Advent has the beautiful and mysterious O Antiphons at Vespers: awesome food for meditation. Christmas itself has four Masses: the Vigil, technically before Vespers, with Matthew’s reading about St. Joseph; then after Vespers the rubrics say, “On the Nativity of the Lord all Priests may celebrate or concelebrate three Masses, provided the Masses are celebrated at their proper times”: at midnight, the Gospel of the angels; at dawn, the shepherds come to the manger; during the day, John’s Prologue. Any of these is worth a full day of recollection. Holy Family on the First Sunday; Mary on the octave; Epiphany on the twelfth day. The fabulous juxtaposion of St. Stephen, the first martyr, the day after Christmas; then St. John, the beloved disciple, the Apostle of love, whose amazing and profound First Letter gives the readings for the Christmas season; then the Holy Innocents. Oh, what liturgy! 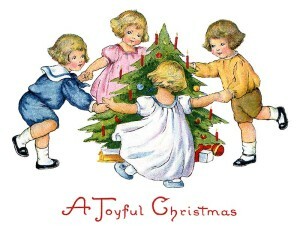 But of course the irony is that this is not how we with families live the Christmas season. I’m sure I could do better. But one of the great realizations of family life is that we aren’t as good as we thought. Daily Mass and a pretty abundant daily prayer schedule, including lots of liturgy, was a no-brainer before I had kids – when it was easy. When it became difficult . . . a lot of it slipped. We are not as strong as we think we are. But even apart from my weaknesses, how could I do it all? During Advent we try to light candles and do readings at dinner. 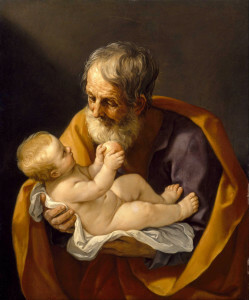 In theory we pray Evening Prayer, with special Advent devotions to St. Joseph, as we prepare for the coming of Christ. In practice . . . gosh, the little boys are tired, bedtime takes a long time, everyone moves slowly. As for Morning Prayer and daily Mass . . . long gone, at least in our family life. I can pull off some of it, but for my wife, always covered in kids, it’s even harder. Christmas Eve is wonderul: but when we sing Silent Night, usually one of my kids is crying, or throwing up. We always ponder doing Mass both Christmas Eve and Morning – but gave up after, with just one child (easy!) we had a diaper blowout on the way to morning Mass. This year we have non-Church-going family in town. What should we do, ditch them, so we can have more liturgy? And the twelve days, beautiful as they are, get largely covered in visiting family. First, we can live the liturgy at a distance. We can poke our heads in here and there, and do our best to remember it. Later in the year maybe we will have some time to pray over the things we didn’t have time to pray over while taking care of the kids. No, my Christmas Eve is not a Silent Night. But both that night, and throughout the year, at quieter moments, I can meditate on the world in silent stillness waiting. We can live the liturgy at a distance. In fact, we’re supposed to: what we meditate in these days is supposed to come with us anyway. So let’s bring it with us. Yes, let’s imagine how cool monastic liturgy would be! Second, family is part of the liturgy, too. The monks and nuns who get to experience the liturgy in its fullness cannot experience it in its fullness unless, just as we follow their liturgy at a distance, so too they follow our families at a distance. Because Christmas is all about Jesus coming as a child, Jesus coming into the love of family, Jesus embracing the fullness of human life and relationships. We live our own part of the Christmas liturgy, in our not-so-silent nights. That’s why we read First John in the Christmas season anyway. He that loves not his brother abides in death (1 John 3:14). If a man say, I love God, and hates his brother, he is a liar: for he that loves not his brother whom he has seen, how can he love God whom he has not seen? And this commandment we have from him, That he who loves God love his brother also (1 John 4:20-21). How do you reconcile liturgy and family during the Christmas season?